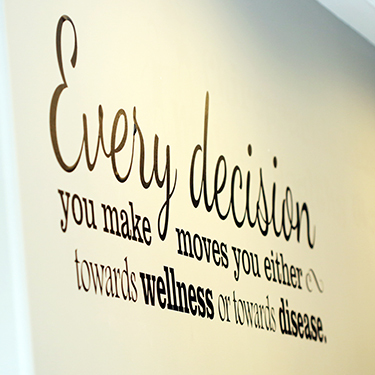 Many people visit Stratford Chiropractic & Wellness Centre initially because they are experiencing pain or a limitation in life, and are looking for answers. We can help! Pain and limitations are usually signs that your body is in a crisis state. At Stratford Chiropractic & Wellness Centre, we go beyond crisis care. We strive to help you achieve overall optimal health and a lifestyle that will allow you to reach your fullest potential. Starting with your initial visit, we provide you with information about your specific health concerns so that YOU can make informed decisions about your care. We encourage you to ask us questions during visits, take advantage of our on-site library, sign up for our electronic newsletter, visit our website, and follow us on Facebook and Instagram, to continually gain a greater understanding of how you can achieve greater health. We believe that it is vital to feel comfortable and at ease in order for your body to heal, and we strive to make every visit enjoyable for all. Our staff are knowledgeable and always friendly, and our office offers comfort for all of our visitors. From our “under-the-sea” play area to our quiet library, our office accommodates everyone. Three of our doctors have completed a fellowship in Pediatrics and Pregnancy from the International Chiropractic Pediatric Association. From our prenatal class, breastfeeding support and specialized adjustments for pregnant women and children, to our kid friendly environment and adjustment tables, we are committed to helping everyone in the family enjoy a healthier lifestyle. While technology can’t replace great professional service, it does increase specificity and allows us to investigate your specific health concerns in greater depth. Our Core Score technology includes surface electromyography (sEMG), Thermography, and Heart Rate Variability (HRV) testing. We also provide digital x-ray services and Gait Scan technology for orthotics, which ensures comprehensive assessment. Additionally, we have used the latest ‘green’ technology to build and maintain our office, and all clinical notes, appointment bookings and office management services are digital. By embracing new technology we provide you with modern services, with greater efficiency, while maintaining your health goals as our first priority. Sound interesting? Call Stratford Chiropractic & Wellness Centre today to make an appointment!